The European Academy of Participation (EAP) is a strategic partnership supported by the ERASMUS+ programme of the European Commission. It runs from September 2015 to August 2018 and brings together 10 partners from all over Europe, including higher education institutions and arts and culture organisations. 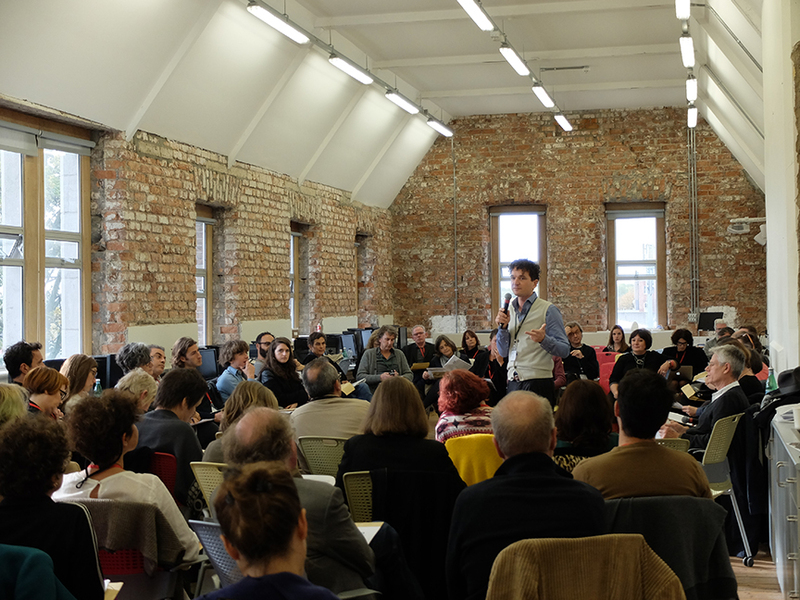 The ambition of EAP is to tap into the existing potential of higher education and the unique and hard-won endeavours of creative projects and organisations scattered across Europe that are engaging the public as active agents in their work. Through interaction, both sectors impact the diversifying societies of Europe, valuing participatory practice in the arts. The composition of partners and their roles in the project demonstrates a commitment to dissolving boundaries between academic and artistic disciplines, as well the boundaries between the policymaker, the artist, the curator and the audience. This increasing flexibility brings about a new practice pro le: the creative producer. The project aims to contribute to a more inclusive Europe, in which people live together with mutual respect for differences. The EAP partners consider participatory practice in art and culture as a central tool to involve communities in a positive process of constructing a shared cultural space. The project addresses participation as a key priority for funders in order to foster social cohesion. It also raises ethical questions around responsibility, authorship and participatory practice as a means to communicate through art and culture. EAP partners want to critically discuss the embeddedness of participatory practice in a political framework that has rapidly changed over the last two years. Before that, participatory art was largely perceived through the historical lens of what has happened since the fall of the Berlin wall. The ‘end of history’ feeling has led to the long-prevailing paradigm of neoliberalism, our current political order of free trade and open markets. In this paradigm, the private sector takes the lead and the role of the public, and that of the state supporting the public, is pushed into the background. Ironically, the term participation has simultaneously been appropriated for neoliberal policies that encourage people to take individual responsibility, as the idea of collective responsibility and a supportive welfare state declines. Political support is focused on the economy and the financial markets, not the citizen. In turn, and quite ironically, citizens and artists have been expected to compensate for austerity politics, being manoeuvred into roles that would ‘artwash’ the resultant misery, which should have been solved by other professionals, such as care takers, city planners and social workers. The Arab Spring and Occupy Wall Street seemed like turning points, with all the hope they triggered across the globe. Alongside the global financial crisis, and with examples like the economic recovery in Iceland through the rejection of austerity measures and the implementation of the Nordic model of welfare government, this seemed a game changer: people took back the initiative from fatigued politicians and seemingly omnipotent banks and multinationals.1 Since then, our hopes have faded and the world has changed for the worse. The revolutionary potential of the people, long believed to be on the left, is now on the right, with populist nationalist movements that battle Enlightenment principles, such as human rights, equality and solidarity. This new politics mistakes nostalgia for culture and sees artists as the enemy. The basic question remains the same: how can artists engage with communities in a mutual beneficial way, towards progress, and more culturally and economically inclusive societies? During the first public conference in Dublin (27–28 October 2016), EAP partners looked back on an exciting first year of research, discussions and collaborative exercises that have produced considerable expertise and insight. The event brought together 90 participants from 12 countries that represented partner organisations and stakeholders from education, culture, policy and research. It had two main aims: to share the outcomes and ambitions of the project in order to involve the education and culture sectors, creating ownership of the project’s activities within this community of practice; and to gather critical feedback on what has been realised so far – mainly the Tuning document, which was based on the methodology developed by Tuning Educational Structures in Europe – as well as plans for the future, such as the design of the course module. All presentations are available at www.academyofparticipation.org. Through analysis of the Tuning document, EAP partners have gathered rich and varied responses, questions, opinions, ideas and examples that will inform the pedagogy of the module. The questions and statements that were generated and discussed through Open Space Technology at the conference were based on prior knowledge of the Tuning document and expanded the thinking underpinning the module. These questions included considerations of the tricky issue of exiting a project, particularly if the practitioner has developed a strong relational network. How are practitioners prepared for the often-demanding personal and conceptual investment required in these projects? Should they be taught self-care in college? What are the particular pitfalls of attempting to ‘teach’ participatory practice and indeed of working in this field? What are the current debates about ownership and authorship? What is the role of the curator? How are the more process-based elements of participative/collaborative practice represented? How can we prepare practitioners to engage in the politics of representation? How and where is participative/collaborative practice represented? What might an open source platform on participatory arts education look like? How do we tackle the question of validation/accreditation for participants? How do we value this participation and how is it funded? And, finally, the question of succession, planning for the afterlife of a project and deciding who, in a complex matrix of collaborators, is responsible for this space. These questions and statements generated a sharing of knowledge and experience, provoked debates and challenges and created critical responses that will continue to inform EAP, and, we hope, contribute to this field of practice. The Dublin conference was the first of three multiplier events foreseen in the project. Following on from the Dublin conference, EAP intend to make the project outcomes beneficial for a broader audience and incorporate them in the educational module that the partners will build as a pilot run at Central Saint Martins, London, in July 2017. In this intensive low-residency module jointly offered by universities and cultural organisations, EAP will target postgraduate students – from the arts, humanities and social sciences – as well as practitioners, including artists, trainers, teachers, curators and others from third sector cultural organisations. Based on a jointly-developed set of competencies, they will engage in an intensive blended learning experience derived from their own respective practices, working on questions and problems that are shared across all forms of collaboration and community engagement. The competencies will be formulated after the consortium has completed a fully- fleshed-out Tuning exercise based on the methodology developed by Tuning Educational Structures in Europe. This will lead to an international benchmarking document that can be used by curriculum builders, employers and other stakeholders. The next EAP public conference will take place in Amsterdam (5–6 October 2017). The working title is Living as Form, drawn from the publication of the same title by Nato Thompson in which he asks whether it is time, at the beginning of the twenty- first century, to return Duchamp’s urinal to the real world from the museum. But the question is whether it would be accepted by the ‘real world’ today, where people are suspicious of the arts and artists in their elite bubble. of the second year of the European Academy of Participation. Encouraged by reactions of peers across Europe, EAP have started to place the project’s activities and outcomes into a longer- term perspective that looks beyond the life cycle of this project. EAP see the outcomes and results of this project as an integral part of a fully- fleshed-out transnational joint Masters, embedded in a strategic partnership network and based on solid ground provided by the Tuning exercise and the pilot module developed within EAP. 1 ‘The True Cost of Austerity and Inequality: Iceland Case Study’, Oxfam Case Study, 2013 (www.oxfam.org). Castrum Peregrini, Amsterdam, The Netherlands. Avrupa Kültür Derneği, Istanbul, Turkey. National University of the Arts, Bucharest, Romania. Central Saint Martins, University of the Arts, London, UK. Universidad de la Iglesia de Deusto, Bilbao, Spain. the European League of Institutes of the Arts (ELIA), Amsterdam, The Netherlands. EAP open space, Dublin 2016.